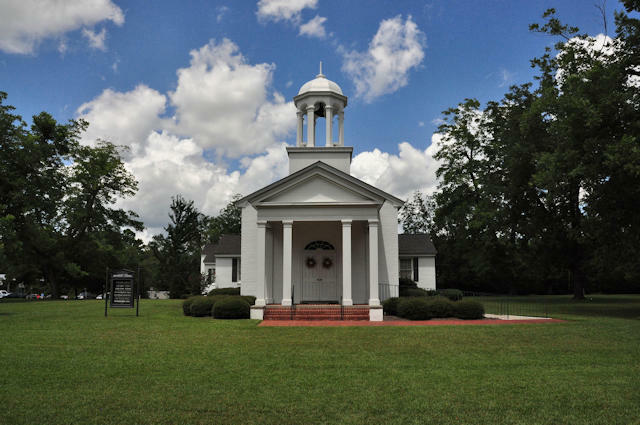 In his book, Architecture of Middle Georgia: The Oconee Area, John Linley wrote: (Allentown’s) outstanding building is the Allentown Methodist Church. Though built in 1956, it is Colonial in style, but was designed with a degree of skill and sensitivity that is rare in any period. W. Elliot Dunwoody, Jr., was the architect. Beautiful with true and correct classical proportions and details. Are you sure this was built in 1956? It really looks more like a building from 1856 when architecturally correct proportioning was understood by even local carpenters. Today most architects don’t even recognize the classical orders. Absolutely beautiful! Never seen it before; it’s on my list now! Brian, you quoted a book on architecture of middle Georgia (which I’ll be on the lookout for now). Are you aware of any similar books dealing with architecture a little further south? Also, any you recommend for the coastal area? Thanks for doing what you do! Thanks for your kind words, Suzanne! I’m glad you enjoy the photographs. The middle Georgia book is hard to find, and likely quite expensive when available. As of now, Suzanne, there are really none available on South Georgia proper, but I’m working on one! Also, Van Jones Martin’s books are some of the best works of architectural photography and they cover various areas of the state, as well as the coast region. They’re available through Beehive Press in Savannah and on Amazon.